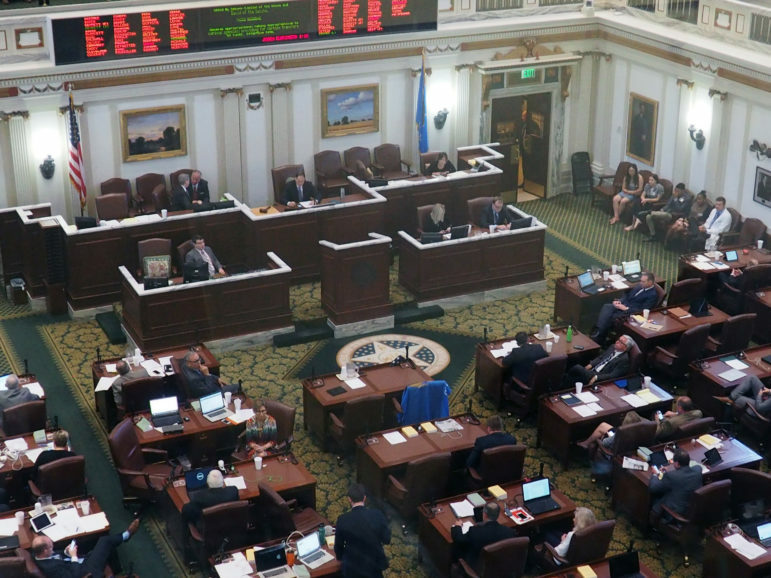 After intense debate, Oklahoma House members voted on the 2018 fiscal budget. The measure passed, 57-42. After months of worries that lawmakers wouldn’t be able to close an $878 million budget hole, the Legislature narrowly passed a series of revenue-raising bills that provide enough money to avoid drastic cuts to state agencies. Few lawmakers – even among Republicans – said it was a perfect budget. It didn’t include any money for teacher raises. It slashed higher education funding by $30 million. It will require many state agencies to make cuts of around 4 percent. And Democrats have raised constitutional concerns about the approval process. But the budget, which Gov. Mary Fallin has signaled she will sign, will have real-life ramifications on just about every state agency over the next year. The Oklahoma Health Care Authority said it might need to cut reimbursements to doctors and other Medicaid health care providers by about 4 percent on July 1, even though its appropriation was increased 4.2 percent compared to what it received in the current fiscal year. Because of projected cost increases, the authority said it needed a 7 percent budget increase to maintain the status quo for SoonerCare, the state’s Medicaid program. SoonerCare contracts with nearly 50,000 health care providers to provide taxpayer-subsidized health services to about 1 million low-income Oklahomans, mainly children. It is one of the biggest line items in the state budget. Next year’s budget calls for a total appropriation of just over $1 billion, up from $984.1 million it received this year. For every $1 the state provides, the federal government kicks in $1.50. The authority has cut provider reimbursements three times since 2010. A doctor in Oklahoma who treats a Medicaid patient currently receives about 87 percent of the amount received for treating a Medicare patient. The Legislature appropriated almost $328 million to the Department of Mental Health and Substance Abuse Services, a 1.7 percent increase from this year’s $322.5 million. Even with the slight increase, the department said Friday it would be forced to make about $3.5 million in cuts in existing programs. It said it needed $331 million next year to maintain current service levels. It said it had not yet identified where those cuts would occur. The department had asked for $20 million in new funds so it could reverse recent cuts in provider reimbursement rates and psychotherapy services. The psychotherapy reduction affected about 73,000 Oklahomans. Those “devastating” cuts will remain in effect, a department spokesman said Friday. Oklahoma House members listen to debate on the 2018 fiscal budget Friday. The Legislature adjourned after the House approved the $6.8 billion plan. The budget allocates $53.1 million to the State Department of Health, compared to last year’s $54.6 million. The department said it had not yet determined how it would distribute the 2.8 percent reduction. But a budget-cut scenario prepared two months ago provides a rough guide. The department said at the time that a 5 percent cut would cause it to eliminate nearly $2 million in uncompensated care reimbursements to health centers serving low-income Oklahomans. In addition, the department said a 5 percent cut would force it to trim nearly $600,000 in funding for the Oklahoma Child Abuse Prevention program, affecting as many as 160 families and first-time mothers, and eliminate $200,000 for colorectal cancer screenings, affecting about 300 people. For educators and education advocates holding out hope lawmakers would fulfill promises of a teacher pay raise, the end of the session was crowned with disappointment. “We didn’t accomplish anything for a long-term plan for teacher compensation or adequate school funding. 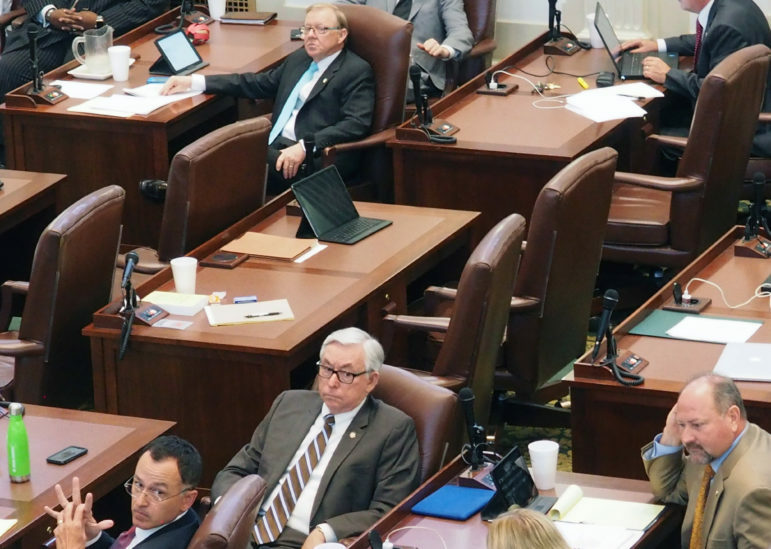 Bipartisan bickering and political games got in the way,” said Shawn Hime, executive director of the Oklahoma State School Boards Association. Common education received a 1.6 percent increase in funding compared to last year, at a little more than $2.4 billion. With many agencies facing cuts of around 4 percent, State Superintendent of Public Instruction Joy Hofmeister expressed gratitude that funding to the Department of Education was spared. School districts have already responded to the budget uncertainty by trimming programs, staff, and in some cases, closing schools. Tulsa Public Schools plans to consolidate three elementary schools, increase class sizes across the district and eliminate some sports programs. Oklahoma City Public Schools is increasing class sizes, as well as reducing central office staff positions and putting the administration building up for sale. The State Regents for Higher Education will take another hit this coming fiscal year, with an appropriated $773.6 million, a nearly 4-percent reduction from the current fiscal year after mid-year revenue failures are taken into account. For this fiscal year, the agency, which provides funding to state public colleges and universities, is on track to receive $805 million, roughly 13 percent less than the $928 million it received in 2016, according to the Office of Management and Enterprise Services. In 2016, colleges and universities raised tuition and fees an average of 8.5 percent to offset those cuts. “Despite successive years of budget reductions, the State Regents and our 25 public colleges and universities remain committed to providing Oklahoma students a quality higher education opportunity at an affordable cost,” Chancellor Glen Johnson said in a written statement. Colleges and universities are expected to present their proposed budgets, which could include tuition hikes for the 2017-18 school year, at the regents meeting June 28. “There is an urgent need to turn around the trend of cuts in education. We must start making progress in our ability to compete with surrounding states in the education of the next generation. Our future depends on it,” University of Oklahoma President David Boren said in a written statement. Both the Department of Corrections and the Department of Public Safety received increases in the 2018 budget following widespread cuts to the agencies in response to this year’s revenue failure. DOC’s appropriation increased almost 1 percent, to $486 million, while DPS’ appropriations rose 7.9 percent to $95.4 million. Agency spokespeople wouldn’t answer if the increases would allow them to recover from the budget cuts they made during the revenue failure, citing policies to not comment on the budget until it has been signed by Fallin and made official. Last month, DOC hit a record-breaking 62,000 individuals in its system, including 26,380 in prison and halfway houses and 1,755 inmates in county jails waiting for transport to a DOC facility. After the revenue failure was announced in February, the agency put in place purchasing and hiring freezes, in addition to canceling 10 contracts with county jails, to save $3 million. DPS undertook mileage restrictions to save on fuel costs, lost employees through attrition and cut back on aircraft maintenance. The agency also has held off on conducting its trooper academy, despite a staff of 790 troopers that falls about 300 short of an ideal staffing level. At the same time, about a quarter of DPS troopers are eligible for retirement. DPS estimates that putting a single person through the academy costs about $158,000. The Oklahoma Turnpike Authority has committed $5 million toward a trooper academy in 2018.